Former Plymouth centre half Sonny Bradley is expecting there to be a bit of ‘bite’ when he makes his return to Home Park with Luton next season. The exact date of the game will be known on Thursday as the League One fixtures for 2018-19 are announced at 9am. No matter what’s been said, nothing will change my opinion of the club, as I had a brilliant two years there. 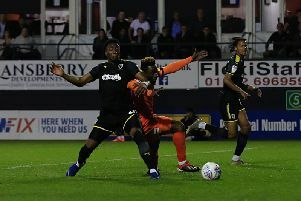 Bradley’s decision to turn down a new contract with the Pilgrims and sign for Luton divided opinions of Argyle fans, with some branding it a sideways step. However, when asked about going back to the club where he made 97 appearances in two seasons, scoring 11 goals, the centre half said: “The Plymouth game now will have a bit of bite to it, which I like. “Whether they clap me or boo me, it won’t make any difference to me. “I’ve got nothing but respect for the football club, nothing but respect for the manager there. “No matter what’s been said, nothing will change my opinion of the club, as I had a brilliant two years there. “Throughout the whole of May, I had conversations with the manager and we couldn’t get a deal sorted. Bradley denied that Luton had put their offer to him before he had decided to move away from Argyle as well, as he continued: “It was after the fact that I wasn’t going to sign with Plymouth again, that’s when I decided to move on. “It wasn’t a case of there were two contracts in front of me, do I pick this one? Or do I pick that one? “That wasn’t the case, the case was, I sat down with Derek Adams, had a conversation with him and we weren’t going to agree a deal. “So it was after that, we shook hands, I wished him well, he wished me well, I said ‘I’ll be moving on’, and that’s when I looked elsewhere, that’s when I decided to move on. It’s not just Home Park where Bradley is anticipating an spicy reception, but Fratton Park as well, as he spent the 2013-14 campaign with Portsmouth. He said: “There are some really interesting fixtures for myself. Bradley is expecting League One to throw up some difficult encounters too, adding: “Sunderland and Barnsley have come down, so it’s a tough division. “Them home and away, there’s no easy games, even Wycombe. “They came up, no matter who goes to Wycombe this season, it’s a difficult game.